Muhammad Ahmed Zaki was born in 1956 in Egypt, and graduated from the Military Academy in 1977. Zaki originally served as a member of the infantry, and was an active figure in the Kuwait liberation campaign in 1991. Zaki remained a prominent figure in the military through the 2011 revolution, and served in leadership roles for several paratrooper units from 2008 to 2012. In August 2012, former president Muhammad Morsi removed several senior officials within the military, leading to Zaki’s promotion to commander of the Republican Guard, a division of the armed forces tasked with defending the president. Zaki was promoted to the rank of lieutenant general in January 2017. A December 2017 law raised the retirement age for lieutenant generals to 64 from 62, prompting Zaki to remain in his position. 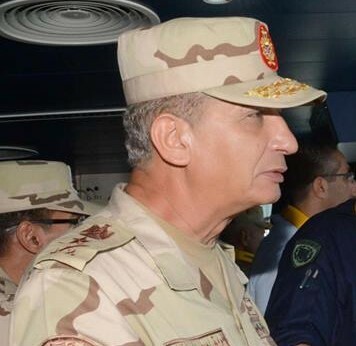 After President Abdel-Fattah El Sisi began his second term in office, Zaki was appointed as defense minister in a cabinet reshuffle in June 2018. Several summaries of his career published after he was appointed defense minister say that Zaki led paratrooper units that secured government buildings during the protests in late 2011 along Muhammad Mahmoud Street in Cairo. It is not clear what role Zaki played in those events, and TIMEP was not able to independently confirm these reports. On July 3, 2013, at the behest of Sisi, who was then defense minister, Zaki detained Morsi, removing him from power. As commander of the Republican Guard, Zaki oversaw more than 20,000 soldiers tasked with defending the presidency and its institutions. Zaki led a group of soldiers into the presidential palace on July 3 and officially detained Morsi. While this action contradicted his role as commander of the Republican Guard in defending the president, Zaki stated that he was acting on “the will of the people” when he arrested Morsi. After Morsi’s removal, 51 protesters were killed by soldiers in the dispersal of a demonstration outside the Republican Guard’s headquarters in July 2013. Dissident army officers have claimed that Zaki permitted the attacks, in which security forces used live ammunition against the demonstrators. Despite the alleged connections to the killings, Zaki did not face charges and denied that he ordered the attack against the protesters. He remained in his post as commander of the Republican Guard following the incident, until his promotion to defense minister in 2018.